The responsibility of the shipping company is governed by the laws of June 18th, 1966 N°67-5 of January 3rd, 1967 and the decree N°66-1078 of December 31st, 1966. The “Les Vedettes de l’Odet” shipping company shall not be held responsible in the case of modification to schedules or cancellation of departures due to force majeure (poor weather conditions, damage, passenger influx, and others). The quality of the service, as well as the beauty of the landscapes and the sea bed, depend on the weather conditions. The duration of the crossings is indicated to passengers exclusively for information purposes and may vary according to the ships. 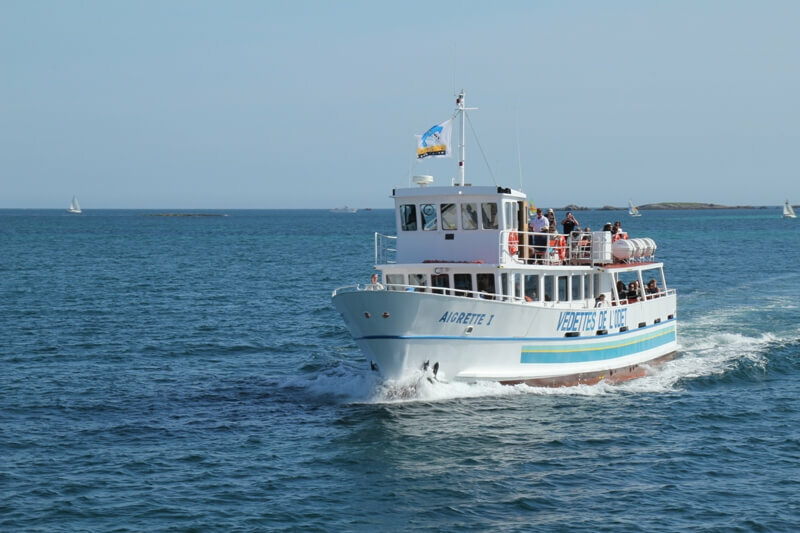 In order to board, all passengers, including children under 3 years old or people travelling free of charge, must be in possession of a ticket provided by the “Vedettes de l’Odet” shipping company. In the event of checks carried out in a branch or onboard, any passenger in possession of a discount ticket must be able to present his/her personal documentary proof. In the absence of valid documentary proof, the passenger will have to pay the full price of the ticket. During boarding and landing, the responsibility of the Company is limited, under any circumstances, exclusively during the period when the passengers or their goods are under its direct control aboard ships, that is to say excluding all public installations such as slipways. Some of our ships have been developed to ensure the transport of people with impaired mobility under the best conditions of comfort and safety. Please note that the services or equipment we provide may be limited: high doorsteps, steep staircases, etc. In addition, the harbour structures are not always adapted to the boarding of disabled passengers. We advise you to contact us in order to make clear your needs so that we can recommend the best possibilities. Group rates are applicable from 20 paying persons traveling together. Fares include the following taxes: harbor dues, use taxes and TPM (Passenger Fee to Protected Areas). A free companion is granted for 20 paying persons. The deposit of 30% is to be paid upon booking. The balance will be paid on the day of the service at the latest. The prices indicated are subject to changes in taxation, various taxes, a significant variation in the price of fuels during the year. Two items of hand luggage are allowed per person. Hand luggage is a way of transporting your personal effects. The packaging may be a bag (overnight bag, backpack), a suitcase or a package fitted with a handle. Handling must be easy. They are kept by the passenger throughout the whole crossing. Boxes, trunks, or parcels are not considered as hand luggage. They are considered as goods and will be treated as specified in the transport conditions. Animals travel under the responsibility of their owners and exclusively after payment of a ticket. Dogs must be kept on a lead and cannot sit or lie on seats. Cats or other small animals must travel in baskets (or boxes). The “Vedettes de l’Odet” shipping company may refuse aboard its ships any animal whose behaviour might disturb passengers. Modification of the reservation is free and depends on our availabilities up to departure. Electronic tickets (not printed and not used) are cancelled automatically and available again 20 minutes before departure. Tickets are refundable exclusively in the event of force-majeure or cancellation of the cruise. If the Company cancels the cruise, your tickets are refundable. If you decide to cancel your cruise – a minimum of 2 hours before the initial departure time – the Company will refund 80% of the total amount of the booking. Your refund request must be justified (death notice, medical proof) to be supported. The front office staff are not allowed to make refunds. Requests for refunds must be made by post to head office at “Les Vedettes de l’Odet – service remboursement – BP 8 – 29950 Bénodet”, within 15 days from the date of the cruise with this Refund request form enclosed and proof. No refund can be made after the departure of the boat without having previously notified.